Kenwyne Jones believes he had a mixed first season at Stoke City after his record £8m move from Sunderland. 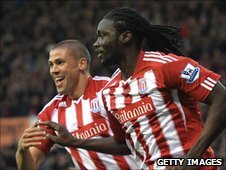 The Trinidad and Tobago striker, 26, scored 12 goals for the Potters. "It was a bit topsy-turvy for myself but it went as well as it could under the circumstances, with all that took place," Jones told BBC Radio Stoke. "I obviously would have liked to have scored more, but you have to be satisfied with what we've done and what we've achieved as a football club." Jones was reported to have personal problems midway through the season, although the player himself has dismissed those suggestions as "paper talk". He made a flying start to his Stoke career, scoring four times in his first six matches, but only three more goals followed between October and March. However, he scored five times in the final eight matches of the campaign, including four in consecutive matches, as the Potters reached the FA Cup final for the first time in their history and guaranteed Premier League survival for a third straight year. Jones also developed a good partnership with Jonathan Walters in the closing weeks of the season, with the pair ending as Stoke's joint-top scorers for the campaign. Both players moved to the Britannia Stadium in August and Jones is not surprised that it took a while for the partnership to develop. "It was all about getting used to each other because we didn't have a pre-season together," said Jones. "We came into the club at the same time. "As the season went on, we grew stronger and stronger. We ended the season pretty well and hopefully we'll be able to elevate that." The Potters, who finished 13th in the Premier League, will be competing in Europe for the first time since 1974/5 next season. Tony Pulis' side will enter the Europa League at the third qualifying round stage in July. "It's a brand new experience for us all," added Jones. "People might see it as a distraction, but for us it's an achievement for the football club and for the city. "We want to go out, enjoy it and have fun."